In the Gospel of John chapter ten, Jesus gives an illustration that every listener would understand. There is a sheepfold where the sheep stay at night, penned in except for a gate, where the gatekeeper lays to protect the sheep. Shepherds bring their sheep, they rest for the night and return in the morning gathering their sheep and leading them to pasture. Jesus says the gatekeeper only allows the shepherd to retrieve their sheep. Someone coming to steal, slaughter or destroy the sheep sneaks in over the wall but would not be allowed through the gate. Jesus’ illustration addresses the religious leadership, there can be good shepherds, or false shepherds. Jesus says He is the gate and won’t allow any sheep to be lost. The story is influenced by the previous chapter where Jesus helped a blind man see and when he went to the temple as the law indicated the religious leaders threw him out. These were false shepherds. Jesus met the man after his expulsion and welcomed him into God’s Kingdom and the man worshiped Jesus. 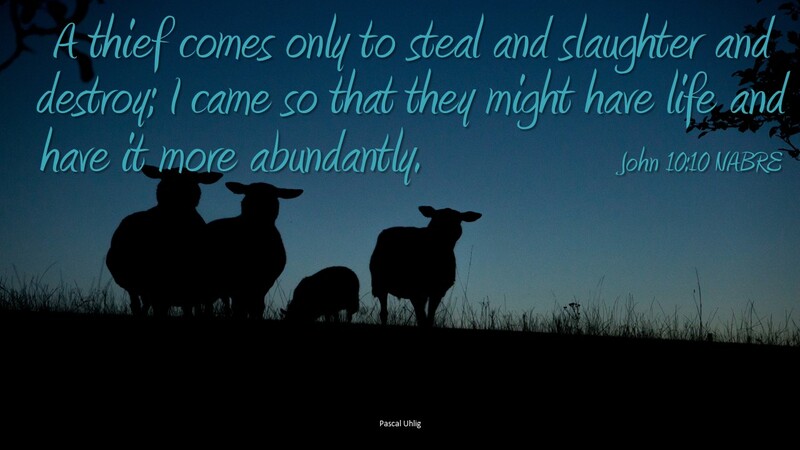 Jesus came for the sheep, they will have life through Him. If your leader cares about things other than you, they are closer to the thieves Jesus mentions. Jesus welcomes everyone so they may have life to its fullest and eternally. Sometimes leaders, pastors, priests, are focused on big things, sometimes the wrong things, sometimes they are just bad shepherds. Jesus wants you to know that He knows about these bad leaders. But you are more important than anything. If you have had a bad experience with a pastor or priest, go to Jesus. Find through Jesus a new leader. Jesus cares about your life. Jesus cares about you. Do you trust your leader? Do you need to change your church?